You should read The Cardboard House, if you haven’t already, because perhaps you have never read a Peruvian novel before. You know all about Machu Picchu, you’ve heard of the Shining Path, you would love to see Lake Titicaca, and you would like to learn a little bit about Peruvian literature. You may also want to read something extraordinary. First published in 1928, La casa de cartón was the debut novel of a young man (Rafael de la Fuente Benavides) who wrote under the name Martín Adán. Benavides’s biography has all the elements of a national myth: a religious calling, two national poetry awards, the tragic early loss of his entire family, alcoholism, institutionalization, poems scrawled in fragments on napkins in bars and assembled, published, and acclaimed by his few friends. His pen name, too, is ambitiously mythological: Martín refers to an organ grinder’s monkey, while Adán is Adam, the original man. 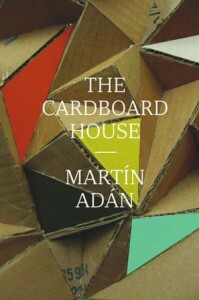 When The Cardboard House was published, it was expected to herald a new age of uniquely Peruvian art imbued with urbanism and the spirit of the avant-garde. Indigenismo literario it was called. On the surface, the novel describes the summer holidays of an adolescent boy and his alter-ego, Ramon. It also describes, for perhaps the first time in Peruvian literary history, a Lima that is real and marginal, dirty and horrible alongside an idyllic countryside. The grammar books are made of cardboard; so, presumably, are the houses and also, perhaps, the Barranco resort in Lima, where the novel is set. The day cackles. A hen cackles like the day — secretive, implacable, manifest, discontinuous, vast. A frond rubs against a house as the chaste swallows protest. Above, the cirrus sky. “Without a doubt, this is the art of the vanguard,” wrote Luis Alberto Sánchez in his original prologue to The Cardboard House. El vanguardismo de lo decadente, Alberto Sánchez called it. The vanguard of decadence. It is unfortunate that, despite moments of fluidity, Silver’s translation is marked by a certain stiffness of prose. She writes: “everything is nothing but your insanity and a Peruvian resort for bathing in the sea” — phrasing that feels unbalanced, like it’s tripping over its own tongue. The editorial decision to break the fragments into discreet chapters has a similar effect. In the Spanish version the sections flow together with little more than a paragraph break to mark the transition to a new day or a new idea. The structure reflects the sense that time is indeterminate and undifferentiated, a feeling that is dispelled by the rigidity of the English translation. Perhaps this is a product of the effort, common among certain publishers, to give Spanish-language literature a North American shape by shortening sentences, breaking up paragraphs, and providing explicit structural frameworks. Here it does not translate well. Printed by New Editions, the publishing house for the classics of the avant-garde, this new edition of The Cardboard House can now, rather unexpectedly, be placed alongside the great aesthetes in the modern American canon: Ezra Pound, Vladimir Nabokov, Octavio Paz, James Joyce. (“Joyce? An idiot,” Adán writes.) In this sense it fulfills the promise set forth in the prologue to the original 1928 edition: as Luis Alberto Sánchez wrote, it is “totally apolitical. Totally artistic, totally literary.” It is perhaps to honor this literary tradition that the novel, having been stripped of its language, is also stripped of its context in this new edition. But it was an error to print The Cardboard House without the prologue by Sánchez and the afterword by José Carlos Mariátegui, two great intellectuals of the Peruvian avant-garde. The substitution of these texts with previously unpublished fragments of Adán’s writing makes the novel feel more academic, which is perhaps an unstoppable consequence of canonization. But it loses the raw feel of a manifesto. We shall not stop coming here at night. In the cup of coffee of the firmament will float, indissoluble, delicate, the lump of sugar of the moon. And all of it will be poetry, my friend. The Cardboard House is a declaration that insists on resistance and beauty in the face of modernity. This is something to which we should not stop returning. And all of it will be poetry, my friend.